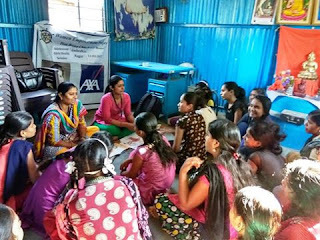 Chinchwad (Pune) 11th March 2017: The Don Bosco Development Society organized a training session on “taking care of reproductive health” for the adolescent girls residing in the Ambedkar Nagar slum of Chinchwad. This session was part of the Don Bosco-AXA project being implemented in Chinchwad. 22 adolescent girls participated in the session. Mrs LalitaChaudhri (Project Co-ordinator) and Mrs. VibhavariKamble (Social Worker) were the resource persons for the session. Educating adolescent girls on reproductive health becomes important as these girls are in a transient phase from childhood to adulthood and they undergo many physical, psychological and emotional changes. The session dealt with anatomy of reproductive organs, early marriage, HIV/AIDS, STDs, nutrition, personal hygiene etc. The parents of the participants has appreciated the approach of Don Bosco on this issue.